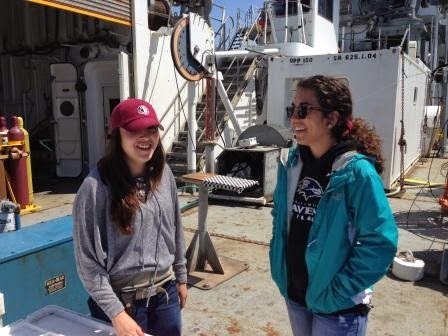 Sharing my experiences as a participant aboard the R/V Melville. 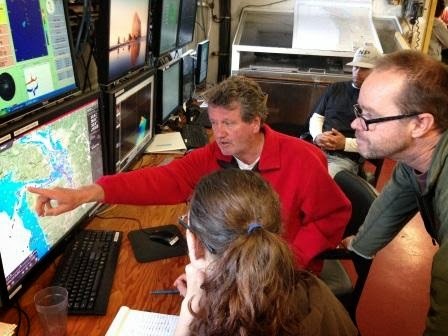 Researching the impact of ocean acidification in the northern Pacific Ocean. 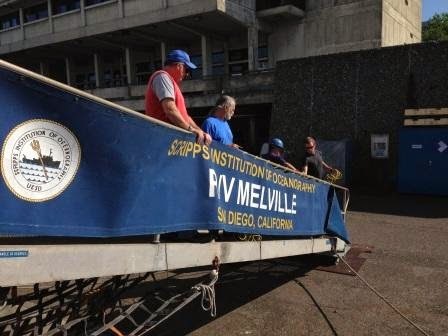 Some time has passed since we departed the R/V Melville. Some of the scientists headed home to be with their families, while others have moved on to their next scientific opportunity. I decided to stay in Seattle for five days to spend time with my wife in one of our favorite cities in the United States. Unlike in my previous research trips, we were able to meet up with some cruise colleagues before we headed back to Houston. The weather was perfect for our stay with air temperatures in the mid-70s and cool winds at night. 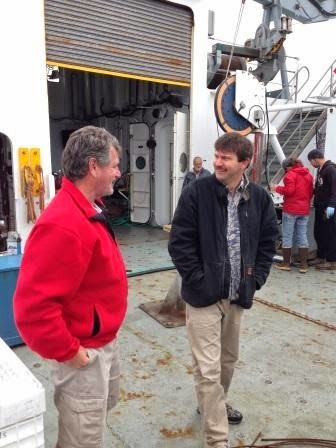 me, and Brian Bill (NOAA-NWFSC). So now that I'm back home, where do I go from here? During the summer, I will clean up and hopefully improve some of my blog entries. I look forward to taking a few hours a day to read them, just as many of you have done. I'll start to think of ways to incorporate my experiences in my chemistry lessons. As important as the science was, I want my students to really understand how critical good teamwork is in order to meet a scientific goal. We had a really good team that worked hard, but also enjoyed the journey along the way. As time passes, more information about our research will become available to the public. I plan to link reports of the research to my blog. I hope that teachers, students and all concerned stakeholders, will continue to use my entries as a means to understand the challenges that our world ocean faces. Please feel free to contact me via this blog and on Twitter. As an educator, I can say that blog writing has been a great experience as a means of reflection. The process was not easy at first, but after a few days it became much more routine for me. When we started our cruise, I would rely on first taking pictures, asking questions to the scientists, then framing the events of the day into the story. After the experiments started and were well on their way, I wanted to shift my focus on the people working on the research. Very rarely, does the public get to see experiments take place. I wanted to present them in a way that was accurate in terms of the science, but I also felt that is was important to show the fun involved in such time-sensitive, and sometimes physically demanding work. 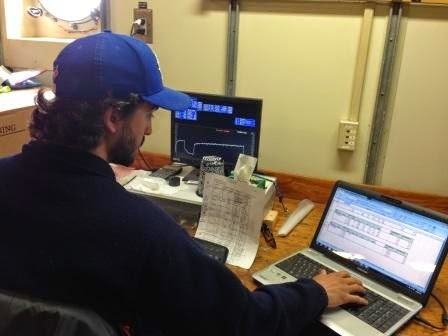 The most challenging aspect of blog writing while on the R/V Melville, was our very slow Internet connection. For reasons unknown, we had spotty connections at best. Trey and I would attempt to snap photos, and compress them for upload throughout the day. We tried our best to sit down and write in between our sampling stations, sometimes only to find that the Internet was not working. The ship's crew was nice enough to stay off the Internet from 19:00 to midnight, giving us more bandwidth to work with. Even then, it could take hours to type, insert photos, format, edit, and finally post. It was hard to deal with in the beginning, but as the cruise carried on, Trey and I managed to adapt and plan. As teachers, that's what we do... I remember someone once told me that teaching comprised of 25% planning and 75% improvisation. I believe that improvisation is what made the stories so much fun to write about. I've been fortunate to been able to meet and talk with reporters from Houston, San Francisco and Seattle. Since returning home, I've have been invited to take part in a panel discussion with my school district, our local junior college system, and Texas A&M, about research trips and practices. I am very excited to share my experiences with them. We will meet on October 30th. I encourage educators to look for field work experiences. The best type of professional development is working in the field. There are opportunities out there, waiting to be claimed. I recommend attending conferences and networking -- there are lots of research projects that often need an outreach component. Teachers serve as that link to the classroom, to their communities and to the general public. A view of the R/V Melville from Interstate 5, Seattle, Washington. I woke up at 04:15, unable to sleep any longer. 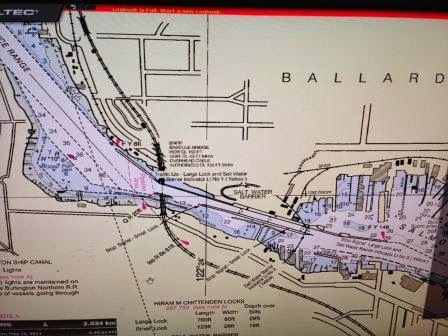 I had been through the Ballard Locks before, so I thought that I would just sleep through our passage scheduled for 05:00, but I just couldn't do it. I have never through the Locks at sunrise, so I walked out on deck in my shorts and t-shirt, and saw an orange glow over the horizon and decided that I was up for the day. I went back down, put on my shoes, grabbed a cup of coffee and headed back on deck. 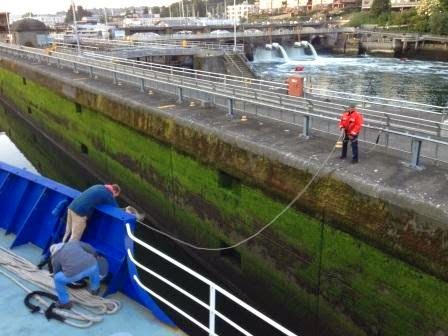 Securing the R/V Melville at the Ballard Locks. Going through the Ballard Locks is necessary because we are passing from the salt water of Puget Sound, into Portage Bay's fresh water. Built into the Locks is a salmon ladder, which allow the fish to pass between fresh and salt water. Lined below the salmon ladder, are glass panels which allow visitors the opportunity to witness the fish navigate the Locks. boyfriend is up early to greet us. Most of the scientists gathered on the 02 deck to watch the operation take place between the ship's crew and the workers on the Locks. As we pulled in, large doors closed behind the R/V Melville. Water began to fill the space occupied by the ship until it rose to the same level as the freshwater side. 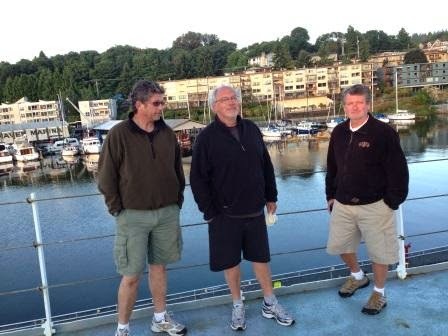 Once we reached the same height, the doors in front of the vessel, giving us passage into Portage Bay. 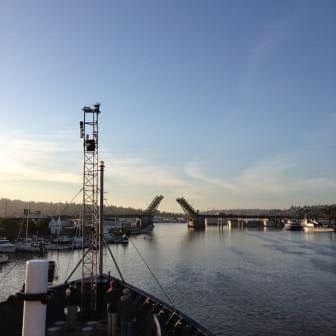 As we slowly steamed toward the University of Washington, we sailed under several drawbridges. Drivers temporarily unable to complete their morning commute, got out of their cars, and watched us pass underneath them. We waved back at each other as the R/V Melville continued toward the UW dock. When we finally reached the docked, we were greeted by Dr. Jan Newton (Univ. of Washington-APL) along with employees from the university. 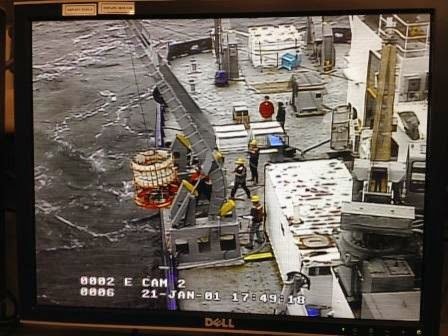 Once the gangway was lowered, several scientists made their way off the vessel, receiving handshakes and hugs after setting foot again on soil. Tying up to the dock. Getting ready to set foot back on land. 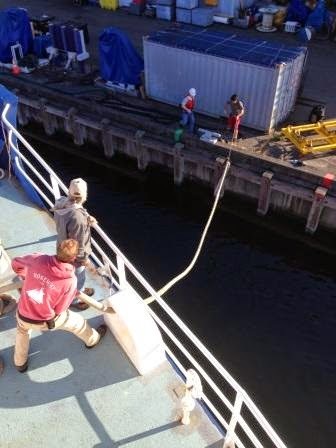 Within the next hour and a half, we managed to move almost all of containers off of the ship. The sun was now much hotter than at any other time during the cruise. 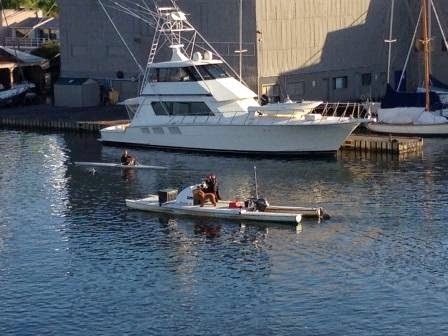 Julian Herndon was on the dock, tying knots onto boxes that were set to be picked up by a shipping company. The NOAA group started shuttling their items from the ship to their offices, just a short distance away. 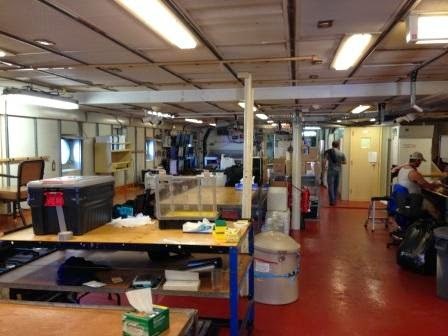 Everybody pitched in with cleaning and returning the R/V Melville's lab to an empty space, ready for the next science group set to board on Sunday. 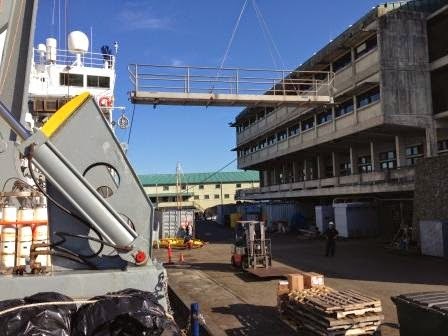 Offloading equipment from the R/V Melville. By 14:00, some of us headed up to a local restaurant so we could enjoy a small bit of normalcy. Even though we were excited to be off of the ship, we couldn't help but shift our conversation toward the work did in the past 25 days. We were reminiscent of the first days. We exchanged stories, shared a few laughs and talked about the future. We returned back to the ship an hour later. There were still files to copy and transfer, as well as more cleaning to be done. Some of us will take a nap, resting up for our gathering at our favorite local pizzeria. There's comfort in going back to where we've ended our previous cruises. 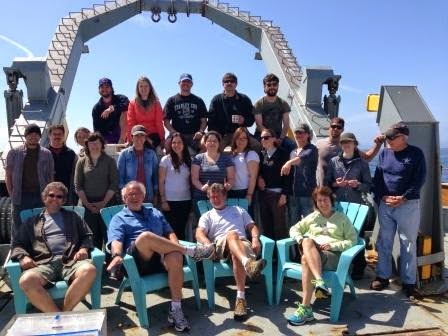 There we will sit together, one last time as a team, to celebrate a successful research cruise. Thanks again for reading. I will write one last post after I return to Houston. I hope that you will share my experience. We are all connected by our world ocean. We have a responsibility to protect it. The deck is now cleared. Even dogs appreciate the ocean. R/V Melville - Salty since 1969. This is for my former USC classmate, Titi Dang. "Wish you were here." Trojans forever. Last night's sunset off the coast of Washington. 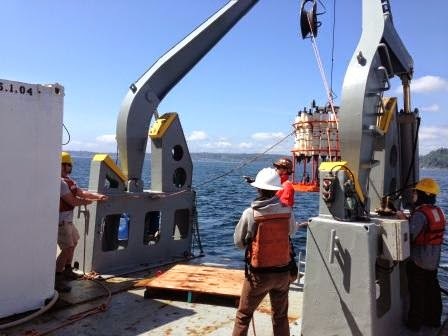 We finished our sampling with two final CTD casts. 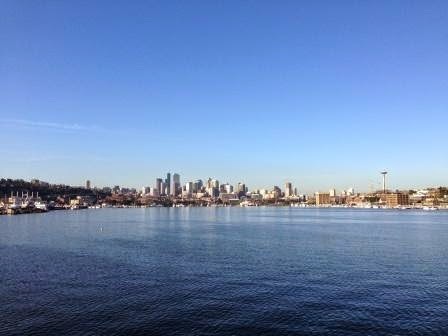 The weather inside Puget Sound was perfect: air temperatures in the high 60s with a slight breeze, accompanied by abundant sunshine. This was ideal for our other big task for the day--packing up. Starting at 08:00, we began to break down equipment, clear the work benches, and wash down our white storage containers with fresh water. They had accumulated a lot of salt from being on deck throughout the cruise. 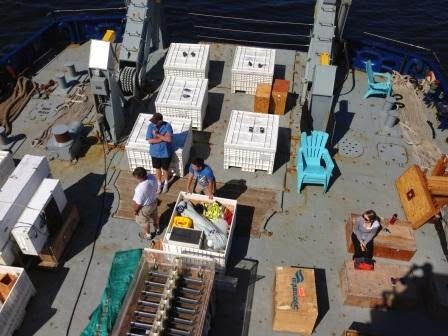 Like worker ants, we moved in and out of the lab to shuttle our stuff onto the back deck of the R/V Melville. 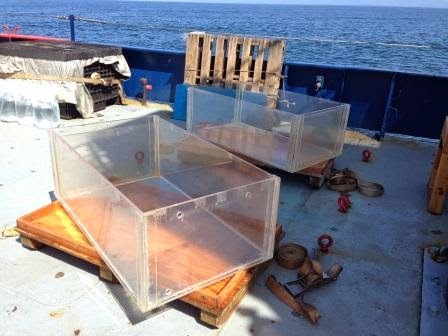 By 15:00, we moved most of our lab equipment and supplied moved into their containers. During the day, I completed another few rounds of reading chlorophyll samples, followed by an impromptu tearing down ceremony of my dark room. It was like taking down a Christmas tree after the holidays--it all came down a lot faster than it went up. A view of the lab in the morning. At the moment, most scientists are backing up their files, cleaning their rooms, and making final arrangements for arriving in Seattle. After passing through the Ballard Locks at 05:00 tomorrow morning, we will slowly steam to the University of Washington where we will unload. This process will take most of day and will conclude by 17:00. After that time, some scientists will head home (in Seattle). Others, will head to a hotel. The rest will stay on the ship for at least another night. Trey and I are packing up as we get ready to disembark tomorrow. I will try to write a post early tomorrow before leaving the ship. I will be staying in Seattle for a few days...looking forward to my wife joining me this weekend. I really appreciate all that she as done for me so that I could take part in this experience. Today is a milestone for me, as it marks my 100th day as a teacher at sea. 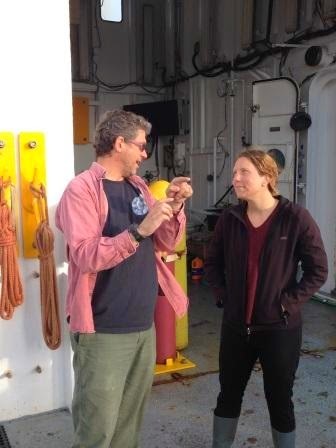 As my fourth research cruise draws to a close, I would like to extend my thanks to our principal investigators for having Trey and I out to sea. Dr. Vera Trainer, Dr. Charles Trick, Dr. Mark Wells, and Dr. William Cochlan are world class scientists. I have learned so much from each of them and wish them well as they begin the next phase in this project -- putting it all together. This is the best professional development a science teacher can receive. I cannot wait to share my experience with my colleagues and students. I believe that every science teacher should have opportunities like I have had. Here are some photos from throughout the day. Enjoy! It's time for bed, Seattle awaits us. This is where we will be at 05:00, tomorrow morning. In 25 days, I read over 1,100 chlorophyll samples on this fluorometer. 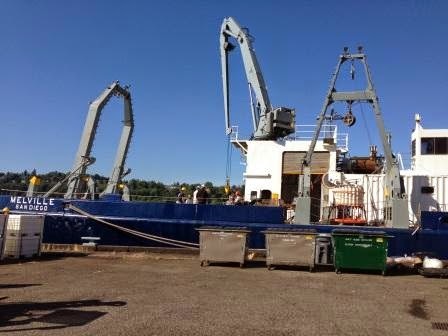 Last CTD cast of cruise 1403. A view of Puget Sound. A view inside the lab after supper. 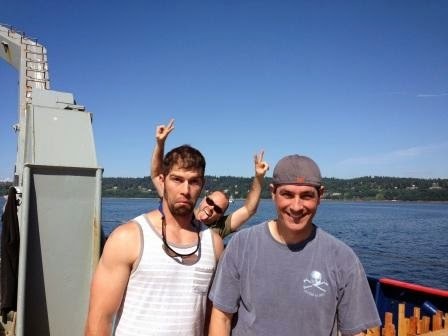 It's hard to be serious when we are being photobombed by Captain Wes Hill. "Happy 5th birthday Kai! Love, Dad." Over the past few days, I've been able to catch up with my old friend, Julian Herndon. Although Julian and I attended USC as undergraduate students, it wasn't until our 2004 cruise on the R/V Kilo Moana, that we really got to know each other and became good friends. We had some of the same classes together while we were in college, but ironically our paths never crossed. He's has a great sense of humor and some of the best stories I've ever heard. He's lived in Los Angeles, San Francisco and Costa Rica, and has set foot on every continent except for Africa. After his time at USC, he followed Dr. Cochlan up to San Francisco State University, where he earned his Masters degree in marine biology and went on to become Dr. Cochlan's research technician and associate. The two of them remain very close as colleagues and friends, with Dr. Cochlan being Julian's son's Godfather. Today is Kai's 5th birthday, and all of us want to wish the little guy a great day. 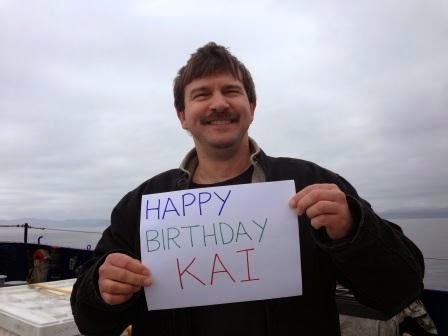 Kai, your dad misses you very much and is very excited to see you, your sisters, and your mom. You have a great dad. I've been thinking about writing this for the past few days... As Julian and I caught up on in each other's lives, I began to realize the sacrifice that is made by these researchers and their families. While this is part of the job, as it is the case with many other professions, it can take a toll on everyone involved. Sometimes, experiments can run into and through weekends (and sometimes holidays). Birthdays and graduations are missed, yet the families of these researchers remain strong and understanding through it all. Oceanographic research is not easy. Once a project is funded, it may take months to plan the trip. Chemicals must be ordered and equipment packed. Experimental techniques are performed in the lab before going to sea. Bills must be scheduled for payment, mail put on hold, and pets looked after. While at sea, there is a disconnect. Life cannot be dealt with quickly -- rather, life is put on hold. Added responsibilities often fall on the families at home. After the trip, there's many more months of data crunching and writing reports on their findings, yet the families remain supportive. 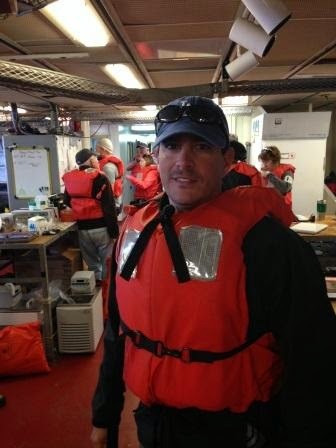 I want to tell you about my colleague and fellow teacher at sea, Trey Joyner... He has a wonderful wife, and four young kids waiting for him at home (along with a new pooch, named Archie). Every day as we sit next to each other to discuss what to write in our blogs, pictures of his kids crawl across his laptop. 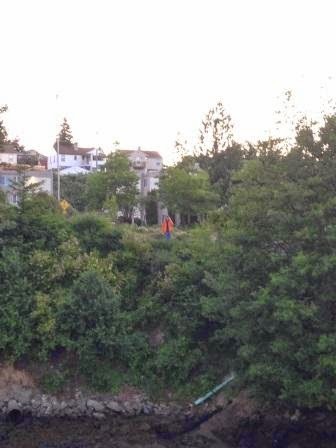 Some of those pictures show Trey and his family during last summer's RV trip across the U.S. One day, he showed me a video clip of him and his family on a cliff at Tower Rock in Washington. His wife Laura, can be seen, protectively putting her arms around one of the kids, making sure that he was safe. She's back home in Tennessee, (I'm sure) ready to welcome home Trey with open arms. He misses all of you, too. The Herndon and Joyner families are just two examples of the support we all need to conduct this research. Without our families, where would we be? We are so thankful for their support and understanding while we are away at sea. We look forward to being home with you soon. up for the end of the cruise. Today has been a day of breaking down equipment and packing up. The incubators have been washed down and are currently drying on the deck. Filtration racks are being dismantled as I am tying this post. Bottles used in the experiments are being rinsed with acid for storage. 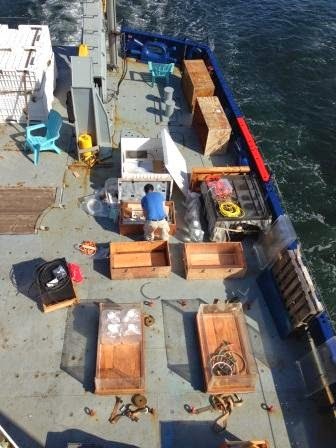 The radiation van is cleaned up and the white boxes on deck are being loaded up with instruments. Today, we also sampled for the last time, water from the Terminator and from the domoic acid experiment. It's a bittersweet feeling. here packing equipment in the rad van. 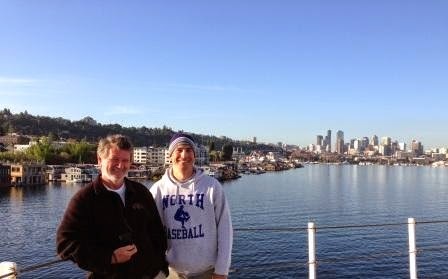 We are currently continuing our cruise through the Strait toward Seattle. We are steaming slowly and will reach our last two stations in the morning. Tomorrow will see our last CTD casts take place. 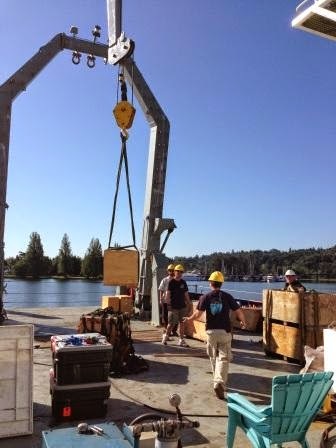 After lunch, we will pack up more equipment--probably working late into the evening, so that we can unload once we dock at the University of Washington. 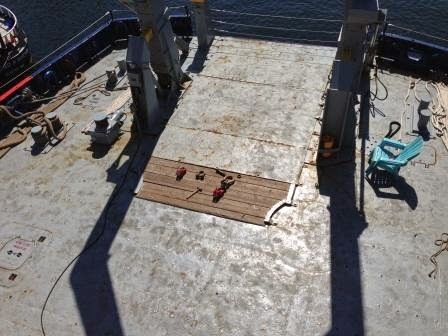 the deck of the R/V Melville. Thank you again for reading. We certainly appreciate your visits to my blog. I'll do my best to get an entry in tomorrow as we transform the lab back into an empty space...for the next group to sail on the "Salty Ship." View of the Olympic Peninsula, Washington state. 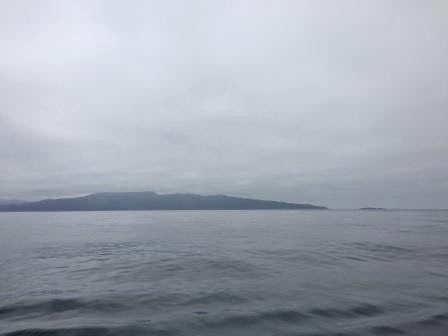 Tatoosh Island is on the right. We woke up to stillness. As luck would have it, we missed the anticipated bad weather as it stayed offshore. 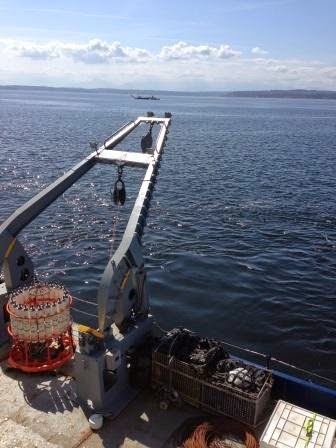 The R/V Melville slowly sailed on the glass-like Strait of Juan de Fuca. Washington state was on the starboard side, while Vancouver Island was on our port side, blanketed in mist. 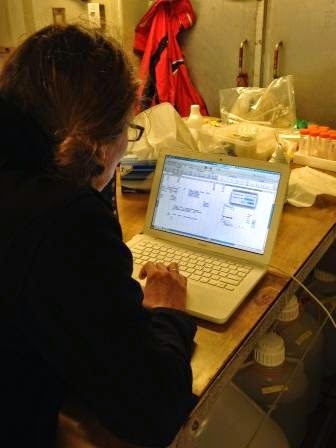 and Hannah Glover (NOAA-PMEL) are processing their collections. We were on station for our one and only CTD cast of the day at 08:00. As the Rosette was cast over the side, many scientists inside of the lab used the time to get caught up with their data. Everywhere I looked, it seemed like someone was transferring data from a notebook onto a laptop. 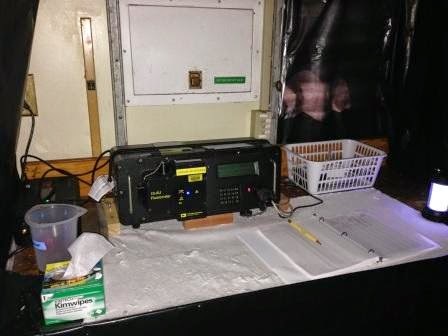 During a cruise, most of the collected data is recorded into lab notebooks. Due to the attention devoted to running the experiments, there's not a lot of time to transfer the data into spreadsheets and other data processing programs. Sometimes, usually late at night, I might find someone entering data into their computers. When I say at night, I mean at 22:00 to 00:00...after the normal 14 to 16 hour work day. Andrew Schellenbach is inputting data from the "FIRe" Fluorometer. 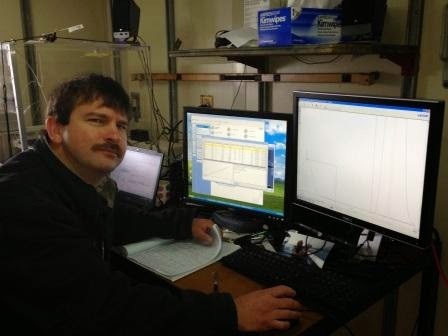 Julian Herndon (RTC-SFSU) was up early this morning to run his LACHAT nutrient analyzer. 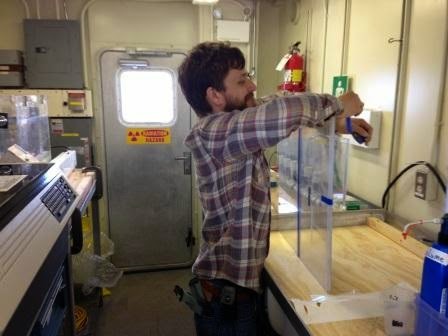 Even though the CTD casts are winding down, he was still running samples. He spent most of his day, monitoring the robotic siphon that drew and deposited fluids into channels that process and reveal the nutrient concentrations of each sample. Maribel Albarran (RTC-SFSU) assisted Julian by making the solutions required for the analyzer. This is a time consuming process, which requires steady hands and a lot of patience. 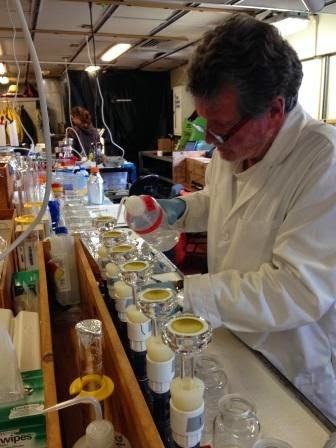 Julian Herndon (RTC-SFSU) analyzes samples or nutrient concentrations. Vancouver Island is in the background. Today was also the last day for our third acidification batch collection. By the time Chris Ikeda (RTC-SFSU), along with Maribel Albarran, and Dr. Charles Trick (Western Univ.) 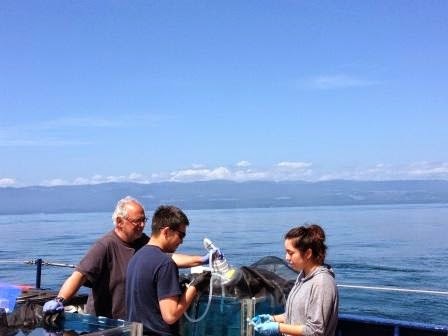 gathered around the on-deck incubator, the morning haze burned off and fully revealed the sun for the fist time in days. There was a sense of relief as they removed the experimental water from the incubator one last time. As I mentioned in a previous post, this has never been done at sea. Even though it will take months before all of the data can be processed, the hard part was done. 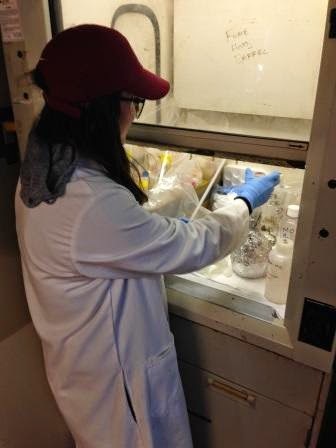 The final samples were taken inside where Trey (Normal Park Museum Magnet) filtered them, while I read chlorophyll samples from the previous day. We had our last fire drill at 12:30. Unlike the last time the bells sounded, there was relief in knowing that this was just a drill. We mustered in the main lab as the R/V Melville's ResTech, Keith Shadle, reminded us to stay safe and remain aware of the dangers that still exist while working on a ship. Even though we are near the end, most accidents tend to happen when people are tired. While we were all gathered in the same spot and time, Dr. Cochlan (RTC-SFSU) took the opportunity to let the group know that we will disembark in Seattle only after the ship's cabins and lab spaces were left cleaner than when we found them. After the all clear was sounded (three straight bells), Chris Ikeda and Dr. Trick headed back out on the aft deck to start emptying and cleaning the incubator. With some extra time to spare, Dr. Wells (Univ. of Maine) and Trey decided to send his GoPro camera down the GoFlo's line. By then, water was clear and the sun was almost overhead -- a perfect time to try to film the process of deploying a messenger weight down the line. They sent his camera down twice... The first time, the camera was attached directly to the weight, the second time, Trey and Dr. Wells attached an L-shaped frame to the GoFlo bottle for a side shot video. Keith Shadle was there to help with the process while I operated the A-frame. According to Trey, he was pleased with the footage that was recorded. I hope to link his videos to my blog after we return to shore--most likely during the summer. As the evening draws to a close, there is still a lot of action going on inside the lab. Dr. Cochlan has been filtering for lipids for the past two hours. Brian Bill has been filtering for carbon and nitrogen for more than an hour. 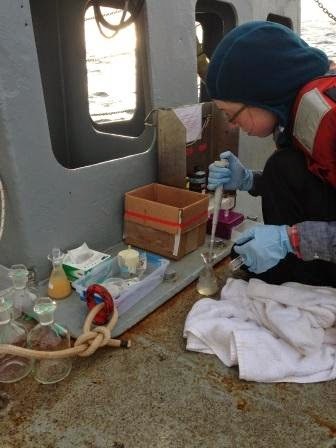 Alongside Brian, is Kathryn Ferguson (NOAA-NWFSC/FSU), who is filtering for domoic acid, saxitoxin, and okadaic acid. 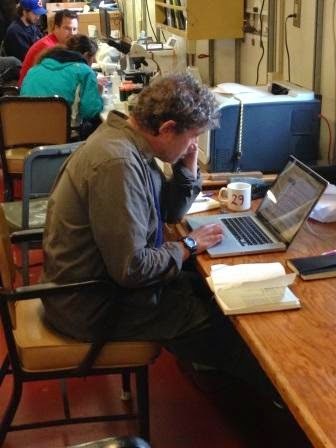 Dr. Wells is back at his laptop, where he was earlier this morning, entering data. Julian Herndon is still running nutrient samples on his analyzer and Rachel Vander Giessen (UW-APL) is in front of the CTD computer, reviewing cast data, planning for tomorrow. Heather Richard (RTC-SFSU) is checking on the beads of her plastic pollution experiment while Trey is sitting beside me, going through thousands of movie and picture files. The plan for tomorrow has yet to go up on the board. 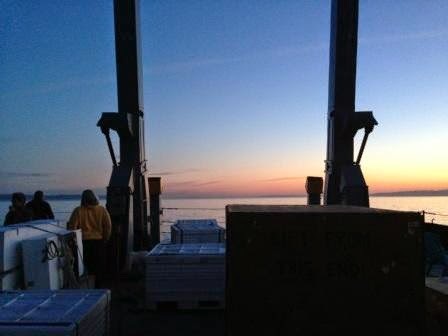 As we continue into the Strait, we will start to clean and pack equipment for unloading on Friday. 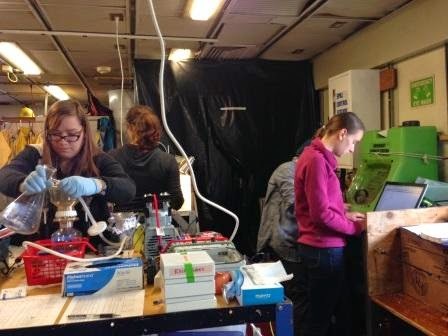 Even though I find it hard to believe that the cruise is almost over, I find it even harder to believe the amount of time that will be spent after the cruise--processing data, inventorying chemicals, and returning lab equipment back to their respective homes in California, Maine and Ontario. Somehow in all of that happening, time is also needed to piece all the data together, to help us better understand what is happening to our ocean. Thanks for reading. We hope to have you come back tomorrow! Three more days until we reach Seattle! on the deck of the R/V Melville. Our transect line for the day. 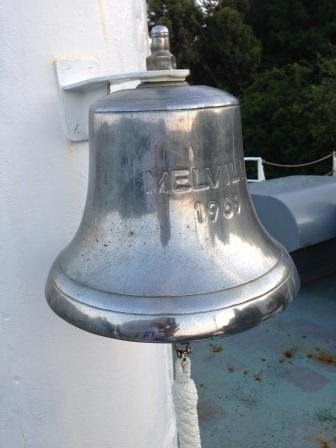 The R/V Melville was on station before 06:00. The ship was rocking in the water, the sun was out, and the wind started to pick up. I turned on my laptop, opened up my programs, and put on some music. Concerto in B Minor for Cello and Orchestra, Op. 104 played softly as scientists slowly started to emerge from their cabins. 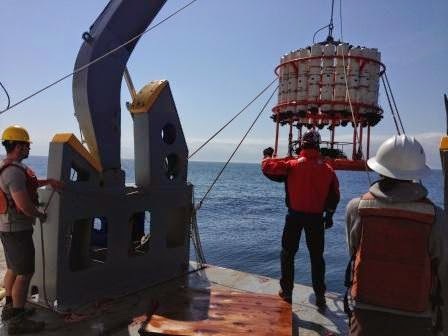 By 06:30, the CTD was over the side and on its way down into the cold, dark North Pacific Ocean. This was the first of six stations that we would be sampling today. 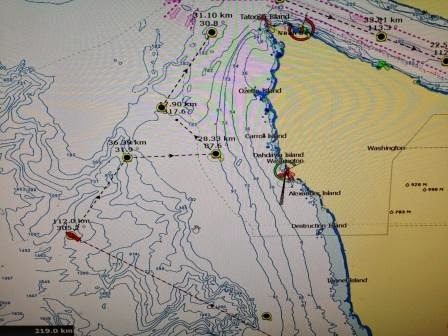 Today's transect line included stations near Capt Flattery, Washington. 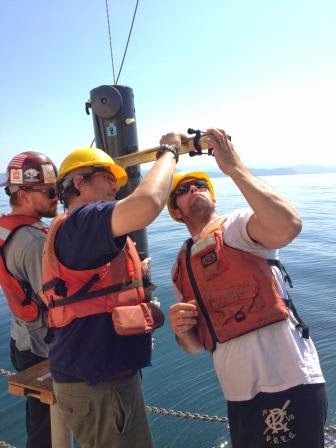 At every stop, we dropped the CTD over the side, collected our abiotic data and processed our biotic samples. The transit to each station was accompanied by constant rolling waves, causing the R/V Melville to toss about like a toy boat in a bathtub. Without any warning, small pieces of equipment shifted, desk drawers flew open, and some of us found ourselves leaning over our work stations. For the first time during this cruise, I was feeling uneasy. I've never really experienced seasickness...but I think that today, I was getting to that point. Around 10:15, I took a Dramamine, went below deck to my room and slept for about three hours. Trey came in to wake me up when it was time for me to take care of extracted chlorophyll readings. I felt groggy, but I was much better than earlier in the mornings, and the samples weren't going to read themselves. We've had several people on board with lingering seasickness, but they continue with their science activities. We continued on with our transect stations until we completed them all just after supper around 18:00. Just like yesterday, it was a steady day. At this point, we are allowing the final experiments to run their course, and will start breaking them down on Thursday. Just before I went below deck, Dr. Cochlan (RTC-SFSU) and Rachel Vander Giessen (UW-APL) spent some time with Captain Wes Hill to discuss the plan for the rest of cruise. 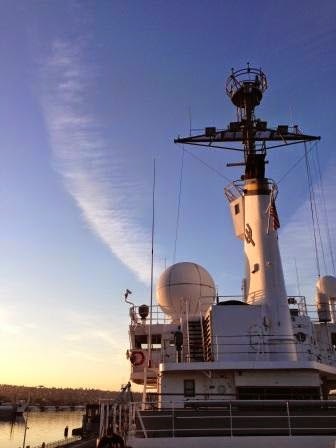 After today, we will begin working inside the Strait of Juan de Fuca, where we will have to contend with active shipping traffic. They also talked about where we should situate ourselves for the rest of the evening. 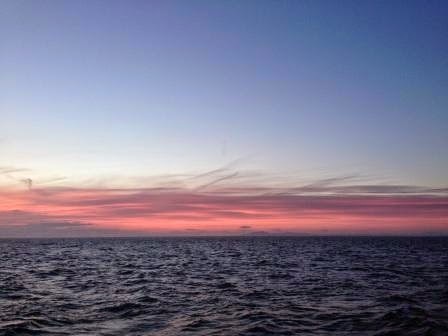 We are expecting some changes in the weather, which will bring some rough sea. We will most likely rest somewhere inside the Strait, hugging the Washington coast. One interesting conversation I overheard today took place between Dr. Mark Wells (Univ. of Maine) and Heather Richard (RTC-SFSU). They were discussing the statistical analysis of data (and correlations) when the topic shifted toward the accuracy and precision of measurements. I enjoyed hearing them talk about this because this is a topic that I cover in my chemistry classes, over and over again. Heather was intently watching Dr. Wells as he used his hands to point out data "here" and data "there." Measurements made with precision are those that are made with the same repeated results. If you think of it this way, it would be like hitting a dartboard in the same spot, each time. If my goal was to hit the 20, but I instead hit the 18 each time in the same spot, I would be inaccurate, but precise. I would be "precisely inaccurate." To be accurate is to hit the intended target (or in the case of measurement, measure correctly). If my intent was to hit the 20, and did so each time, I would be accurate. If I did so but in three different spots, I would be accurate and not precise. When making measurements, we want (and need to be) both accurate and precise. We need to make our measurements the same way each time. If not, we will likely end up with relatively large error estimates in our measurements, making it more difficult to discern trends and show statistically significant differences between experimental treatments. forth during the cast. Oceanographic research is dangerous work. Tomorrow we will sample from our batch experiments with the plan to be done with them by Wednesday. 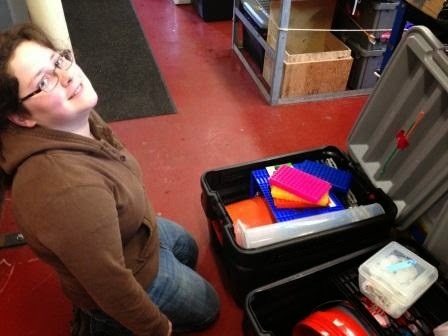 After the experiments are complete, we will start to load up our instruments for our Friday arrival in Seattle. 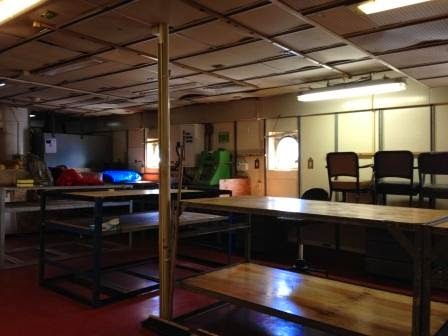 We will spend the remaining days or the cruise in calmer waters, making it easier to pack up. The overall feeling is that this has been a successful cruise with the principal investigators seem pleased with the way things have gone so far. As the evening is winding down, Dr. Wells is sharing his photos from his Antarctic expedition -- researching nitrification on a frozen lake. I am in awe of what I am seeing. Some of his pictures include a visit to what remains of Robert Falcon Scott's cabin. In one picture, a dead penguin lay intact, frozen on a table. Robert Falcon Scott never returned to his cabin, dying while exploring Antarctica in 1912. I can't even fathom the sacrifices made by early explorers just to perform science... 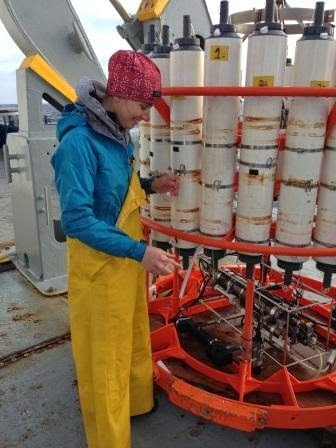 I feel so fortunate to be able to take part in oceanographic research. Four more days... Keep checking back for more updates as we begin to wind down our research cruise. 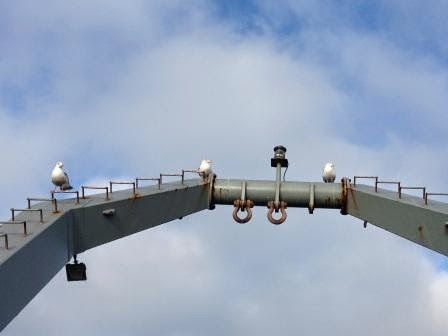 Hitchhiking seagulls, interested in our research.